Alex from Bromige Financial approached us to discuss his outdated site back in the spring. He was after a website that would allow his financial advisory firm to stand out from the crowd a little. 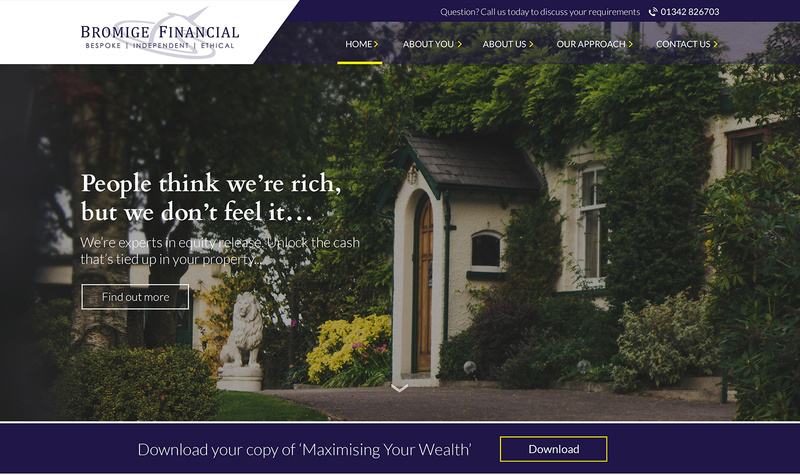 Rather than the traditional 'Pensions & Investments' hard sell he wanted the website to be far more personable and relatable to his prospective clients. The old website was running off a do it yourself style content management system that was limiting the potential of the site. Along with traditional website content, Alex was keen to push some lead magnets. He'd created a series of e-books that he wanted to offer for download. Something that was much harder to implement through the old site. The existing website was also static and lacked any real mobile responsiveness. Working with Alex we came up with a new revised structure for his businesses website. Integrating a series of functions and bespoke, flexible page templates that he's able to implement and edit and any point in the website's lifespan. The new website launch as is often the case was also a great time for a little logo design refresh. We made some small tweaks to the existing logo and wanted to focus on using the purple as the new feature colour for his branding. Along with the usual content management features that allow for easy updates and revision of the site's text and imagery this system has also had some features added to allow easy addition of e-book downloads in partnership with an existing MailChimp account. This allows for the sending of personalised bespoke emails to those who sign up for his e-books directly via the website. To discuss a website design project that you are considering undertaking please don't hesitate to get in touch for a chat.